Croatian company Offshore Boote is specialized in motor yacht charter from one of the most attractive starting points on Adriatic coast, Marina Kremik. They have a successful tradition of 20 years and one of the biggest motor yacht fleets in Croatia. We choose Booking Manager as our exclusive booking system because it significantly simplifies our everyday work. It is precise, reliable and efficient! We use it to manage each step of a booking process and to conquer new markets. Offshore Boote is a Croatian charter company, founded in 1997 in Primošten. They have continued success journey from their starting point as the favorable position of the marina, between Šibenik and Split, enables clients to reach by short terms breathtaking destinations such as National Park Kornati, islands Brač or Hvar. Offshore Boote offers 23 motor yachts from worldwide best-known shipyards like Ferreti, Princess, Jeanneau and Lagoon, which are carefully maintained and guarantee safety, adrenaline and luxury at the sea. Offshore Boote team takes a time and effort to instruct precisely guests before leaving the port. Detailed instructions on taking over the yacht are provided in order to enable a better experience and prevent any potential issues. The team consists 22 professionals who are available for clients 24/7 and are working all year long in order to deliver great result during the sailing season. Since the client's satisfaction and safety comes first, Offshore Boote team is at guest disposal all along the coast, to be covered in case of any unexpected situation on board. Motor yachts, by their basic performance are offering that special feeling of adrenaline while floating over the water. But for those who fancy a little bit more of sports action, Offshore Boote offers water-skiable boats. The 6.40 m to 6.45 m long rigid inflatable boats "Brig Eagle 645 & AGA Marine / Spirit 640" with 175 hp engines leave nothing to be desired in terms of driving pleasure and are ideal for all sorts of water sports with offered equipment: water ski, wakeboard, fun tire or banana. Additional extras are also bookable in order such as extra final cleaning for a pet, parking place at the marina, airport transfer or safety net, in order to meet different requirements that guarantee carefree holiday for a client. Whether a client is looking for luxury, commodity or adrenaline experience, Offshore Boote puts an effort to make it a memorable one. To make it easier to book their attractive offer, in cooperation with Booking Manager, Offshore Boote developed an interactive website. Each website visitor can make a virtual tour on every boat and when sure that it’s a right choice for them create an offer for himself with few mouse clicks. 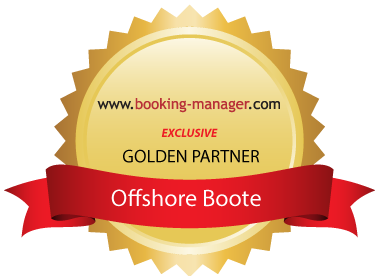 In addition to improved online promotion, Offshore Boote has chosen Booking Manager as an exclusive booking system to manage and promote their fleet. They have been using the System since 2009 to simplify everyday work and connect with more clients. Successful worldwide partnerships are the greatest testament of Offshore Boote quality, which continuously confirms itself by increasing number of satisfied repeat customers. For more info, check Offshore Boote website.